John Tallman ... Dr. Slag, PhD. Li'l Eggwhite: Hey Professor, you're real ugly now! Considering that the first two Class of Nuke 'Em High movies got a combined 5 out of a potential 20 I wasn't expecting much from this third offering and I was right in my assumption. Arguably Troma's second most famous franchise Nuke 'Em High are standard Troma affairs. Namely they look cheap, they fail to be funny, riddled with puerile humor and lots of t&a. 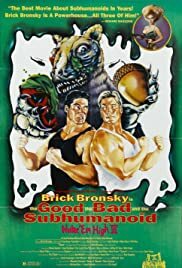 Full of the usual punks, 80's music and naff looking gore I was unsurprisingly unimpressed by this third movie and it's nonsensical tale of super powered twins. Truth be told I hate Troma, I think they're moronic movies and don't believe I've watched a single one of their films and considered it watchable. I don't care how ridiculous it looks, I want Dicks jacket!